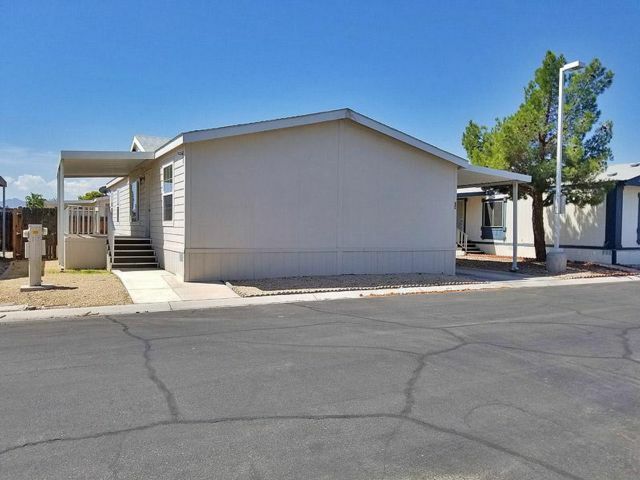 Valley Vista Mobile Home Park #24A – Looking for a nice, gated family mobile home park and a manufactured home with 3 bedrooms and 2 full baths? Don’t miss this one! As you enter this home, you will feel very welcome and immediately have a spacious and comfortable feeling. The home has NEW carpeting and beautiful NEW wood laminate flooring in the kitchen and dining room. The new flooring gives the home an elegant feel. The kitchen offers plenty of cabinet space, a NEW microwave, dishwasher, stove and refrigerator with ample counter space. This mobile home has been freshly painted inside and outside. In addition to the flooring, many other items are new as well including the light switches, daylight bulbs in the kitchen and the toilets. The water heater is 1 ½ years old. The stove is 6 months old. The clothes washer is 3 years old and the clothes dryer is 1 year old. All appliances will be included with the home. The dining room measures 9×12 1/2. The master bedroom measures 14×13. The guest bedroom measures 11×12 and the 3rd bedroom measures 9×13. As you can see, the rooms are nice size for you and your family. There is a large back yard and the outside steps have been recently re-carpeted and the siding painted. The existing loan is assumable. This is a lovely home inside and out. Let me take you on a tour of this beautiful home. Call Today!